According to Ms. Sommer, opossums are beneficial by eating the harmful, unwanted pests around our homes such as snails, slugs, spiders, cockroaches, rats, mice and snakes. The worst dangers to the orphans are chilling and dehydration. 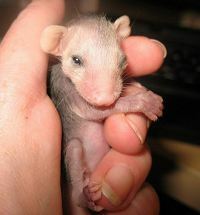 The best way to warm up an opossum baby is to wrap them in cloth and hold them against your body. Alternatively, you can using a disposable plastic bottle filled with warm water. Wrap the bottle in an old t-shirt and place it inside a box or plastic container with the baby. Make sure that it will not roll around, possibly hurting the animal. Do not use a towel or else there is a danger of the threads getting caught around toes or tails. T-shirts, sweat shirts, or blankets cut into small squares work great. If the babies are well furred, you may try to give them fluids to keep them hydrated before you transfer them to the nearest wildlife rehabilitator. Pedialyte or clear Gatorade will work. Dilute either with distilled water 1 part to 2 parts, warm it to body temperature, and offer it slowly with a dropper. Even small infants have the ability to lap.